August 2018: The weather during the first half of the year has, not surprisingly, influenced the reports of rays. After a stormy first four months with relatively few sightings the hot, calm conditions have provided have provided excellent diving conditions and subsequently lots of sightings of rays by divers. The photo database has increased to include over 650 rays with a significant increase in the number seen on more than one day (108), all of these are being given names in alphabetical order and we’re now on the fifth time through the alphabet. The data shows that the rays may remain local to a very specific spot for several days, but also appear to find their way back after prolonged periods. Our most seen ray is “Grayce” having been seen 7 times between May 2016 and June 2018. “Al”, as seen on the recent TV appearance in Beach Live, is the ray with the longest period between first and last sighting. He was the first ray to be named in 2012 was seen again for only the fourth time in 2018, six years later but very close to originally position. When we first encountered Al he was already a adult fish; given that undulate males only reach maturity at about 8 years old, Al must be at least 14 years old. When a ray is seen again, it is almost always at the same location as its first sighting but we do know they can move. A ray called “Cathode” appeared at Chesil this year after being seen near Kimmeridge last August, and a ray “Lemar” was tagged by Cefas in Lyme Bay last year and was seen near Anvil Point this year. It will be interesting to see if any of these find their way back. March 2018: A fantastic response during 2017 has grown our photo database to over 500 individual rays from just over 100 at the start of last year and fifty-nine (59) of the rays have been seen on more than one occasion. This already represents a unique collection of data. Over the winter we put together a status report (Download Report) for anyone who may be interested. We suspect the computer system may miss recognising a few photographs, it’s entirely dependent on the image quality, but we have learned a lot over the year. The system is much more reliable if the fish is flat rather than held vertically, and flash reflections can be an issue. Most of the photos we get are workable and sometimes the ability of the computer to pick out the same fish is truly amazing. We are continuing the project in 2018 and expect to see some of the same rays showing up again in the same places. December 2017: We are just short of 500 individual rays in the photo database as winter arrives and the number of rays being seen drops. This compares to 107 this time last year! The project has progressed much better than originally expected thanks to everyone sending their photos. 59 of the rays have been seen more than one occasion, some three or four times but always from the same place that the ray was first seen. The longest time between the earliest and latest sighting of the same ray is 4-years, again still in the same place, therefore next year we hope to see many of the rays from this year. Additional analysis of the data and some alternative identification techniques are planned for over the winter period. In early November 2017 we gave a short presentation at the Dorset Coast Forum Annual Meeting, a partnership organisation that looks at the issues facing the Dorset coast. 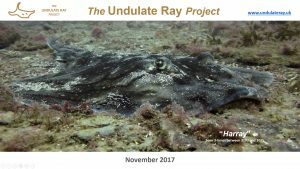 Using examples from many of the named rays, the presentation tells the story of The Undulate Ray Project from its inception with the simple question, “can you recognise an individual ray from a photograph of its dorsal pattern?” to the latest data gathered during the 2017. Although it is still too early to present conclusions we were able to describe the photographic recognition process, the fantastic response from people sending photographs and the efforts to gather DNA samples that will assist the understanding of the genetic structure of the wider undulate ray population. A pdf version of the presentation can be download by clicking on the link at the side. August 2017 - The undulate ray project is pleased to be assisting Samantha Hook from the University of Manchester by collecting DNA swabs from undulate rays in their natural environment. 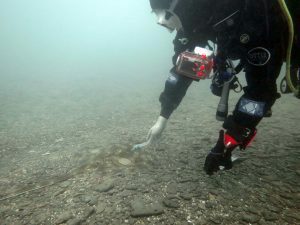 The samples are collected by divers, from the original study site using a swab to collect mucus and skin cells from the dorsal surface of undulate rays. The strong site fidelity of undulate rays (Raja undulata), where rays stay or return to the same area is evident in the data being collected by the project. So far all repeat sightings of individual rays are from the same local area as the original sighting. 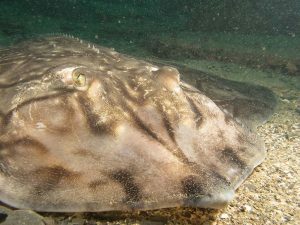 The project at the University of Manchester is using genetic markers of undulate rays to determine the differences between populations from Morocco to the English Channel. This helps us to understand the structure of the existing known population and whether individual populations have become isolated, potentially making them susceptible to diseases due to a lack of genetic variation. Analysis of our samples will assist understanding of the genetic structure of the wider population and identify relationships of the fish known to The Undulate Ray Project. April 2017 - Rays are known to have high site fidelity, returning or remaining local to a home location. Tagging programs typically report most returns within 5-km of the initial tagging but greater distances are often recorded. 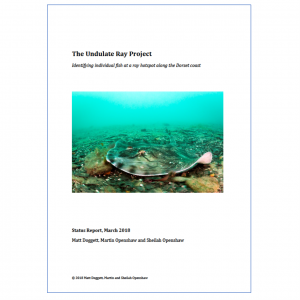 The undulate ray project currently covers over 200-kms of the UK south coast from Selsey Bill to Start Point. To improve both the chance of matching photographs and to partially evaluate the efficiency of the matching software with large numbers of images, we first process the photo in three regions (west of Portland, Portland to Christchurch and west of Christchurch, then we process again with the full set of images. 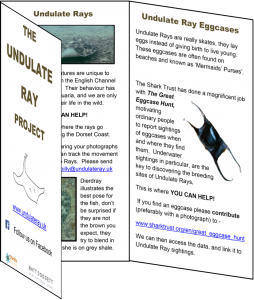 January 2017 - We launched the project in January 2017 and had a fabulous response with people sending past images of rays seen or caught along the south coast. We limited the easterly extent of the project to Selsey Bill, so not to overload with the amount of input. Many of the photos were not originally intended for recognition, but we learnt a lot about how best to process the photos and what would work in the image recognition software. Check our web page (Images for ID) for what works best. Now almost every image is usable and goes through the image recognition software. Occasionally, very obscure ones we keep separate to ensure the quality of the future reference set, and we have a growing set of rays with distinctive marks or features, similar to Billy's black spot. Prior to 2017 - In 2012 we discovered a site along the Dorset coast where, at the right time of year a diver could almost guarantee seeing a ray. We quickly discovered that individual undulate rays can be identified by the pattern on their upper dorsal surface. 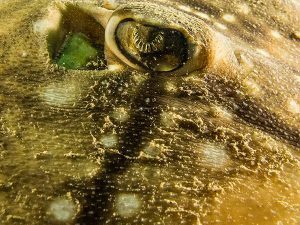 Four years of observation and the addition of computerised recognition software has provided some interesting data; the majority of rays we see are undulates, and approximately one third of them are fish returning to the site, sometimes not having been seen for two or three years. We started to name fish seen on more than one day, in alphabetical order and we’re currently starting our second run through the alphabet. "Billy" remains our favorite ray, with a distinctive black spot we've seen him on the site 5 times. 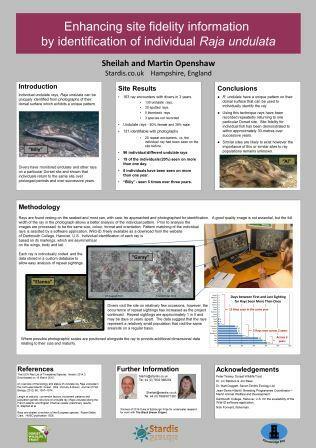 The data up to the end of 2015 was presented at the European Elasmobranch Conference in October 2016, see the associated poster. It was at the conference we became convinced to take the project a step further and the current Undulate Ray Project was born.